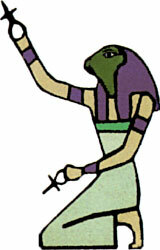 Heket was the Egyptian frog-goddess of childbirth. She was depicted as a frog or a woman with the head of a frog. On temple walls she was typically in anthropomorphic form, while on amulets Heket was usually in animal form. Heket was initially described in a magic spell (PT 1312) of the Pyramid Texts -- which was designed to enable the pharoah to rise to the heavens. Heket's association with childbirth was first clearly attributed with birth in the Westcar papyrus which dates to the Middle Kingdom. The text details the miraculous birth of the first three pharoahs of the 5th Dynasty. Heket hastened the final stages of labor and delivered the babies safely. Pregnant women often wore amulets and scarabs featuring Heket to protect them during childbirth. She was often featured on ivory knives dating to the Middle Kingdom. These knives were used to magically protect the home. Midwives were called "servents of Heket." Temple to her at Qus in Upper Egypt. In the tomb of Petosiris there is a text relating a story of how Heket led a processsion in her honor to her temple at Her-wer and requests its restoration. Her cult center may have been in Her-wer, but this has not been proven. Heket was featured on the temple walls at Abydos receiving an offering of wine from Seti I.